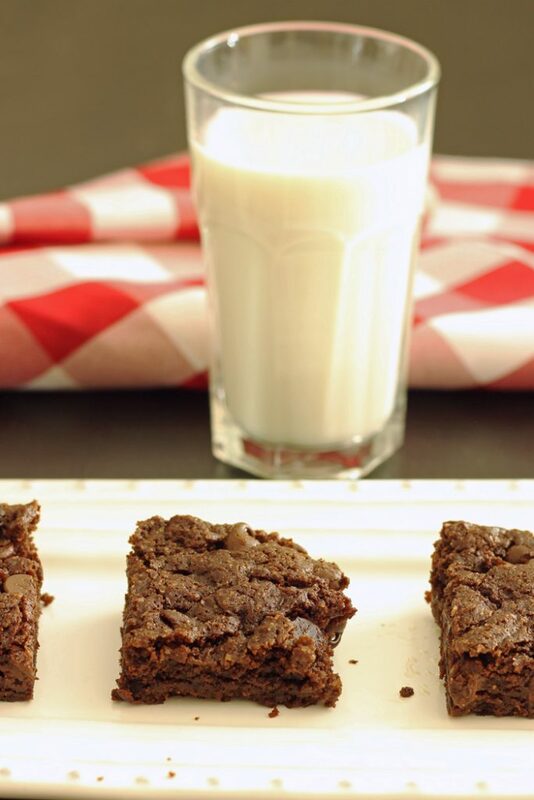 Ditch the boxed brownie mix! These Cocoa Brownies mix up quickly and taste amazing, full of chocolately flavor without the junk. I love brownies. But, frankly I consider it ridiculous what they charge for a box of brownie mix. I rarely find it worth the price even with a coupon. Instead I make my own mixes. In fact, when I’m really on my game, I make several batches of brownie mixes at once to stash in the pantry. Then we have a supply of brownie mix without the preservatives and other junk the big brands add. 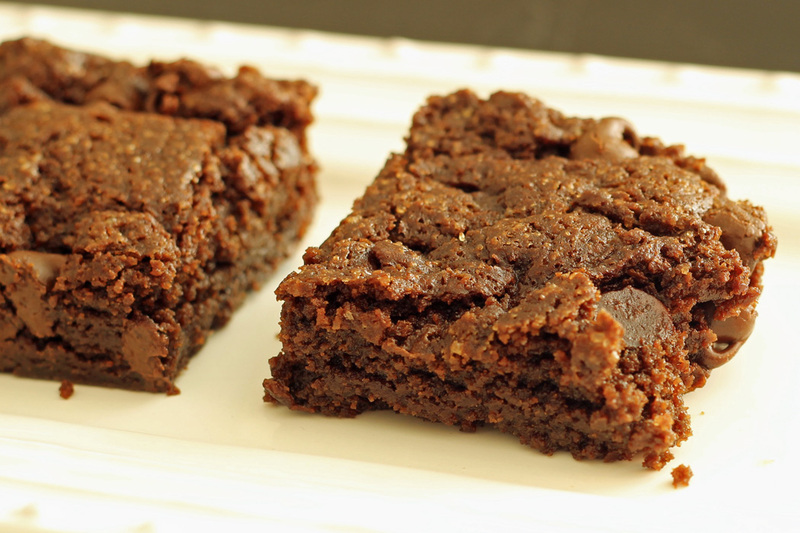 This recipe for Cocoa Brownies is super easy to mix up, no fancy ingredients. No junk. One of the things I love about it — besides being able to make it into a mix — is that you can doctor it up in many different ways. Want peppermint brownies? No problem. Stir in peppermint extract and peppermint candies. Craving a little mocha flavor? Stir in some instant coffee or espresso powder? Care for a little south of the border flare? Mix in cinnamon and nuts. There are really no limits to what you add to cocoa brownies. I tried it this past week with marshmallows and chocolate chips stirred in. I wasn’t sure what would happen. I can now safely report that it’s not a great idea. The marshmallows kind of melt and don’t give it that rocky road texture I was hoping for. In case you were wondering. Brownies are excellent for brown bagging, gift giving, and afternoon snacking. If you want something even quicker than a brownie mix, bake up your brownies. Cool them completely and cut into squares. Then store them in an airtight container. Store them in the freezer so they are ready when you are. Hint: they are really good still cold, so you don’t have to wait for them to completely thaw. Yum! 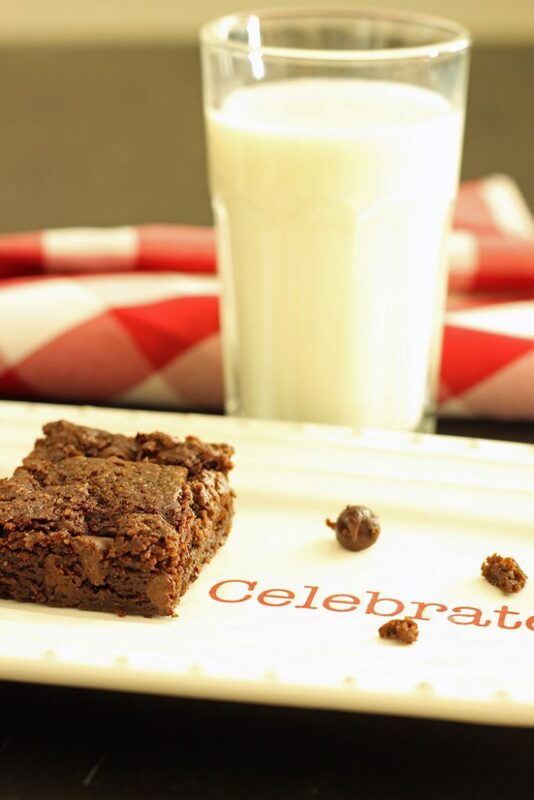 Pyrex 8-inch square baking dish – this one comes with the lid so that you can store the brownies in the pan. Preheat the oven to 350. Grease an 8-inch square pan or line it with parchment paper. Place the oil, eggs, and vanilla extract in a large mixing bowl and stir to blend. Add the sugar, flour, cocoa, baking powder, and salt to the wet mixture. Stir gently to combine. Fold in mix-ins, if using. Spoon the batter into the prepared baking pan. Bake until a tester comes out with few crumbs attached, about 25 to 30 minutes. Cool. Cut into squares. Brownies can be wrapped in plastic wrap and stored in a ziptop freezer bag in the freezer for up to 2 months. or layered between waxed paper in an airtight container. If preparing this as a mix, mark a quart-size ziptop bag with the wet ingredients and baking instructions. Combine the dry ingredients in a bag and seal. Store in the pantry until ready to use. Store the mix in the freezer for longer shelf life. I had a recipe that you spread a jar of marshmallow fluff over the warm brownies. And you can top the fluff with chocolate frosting or eat as is. They are rich but really good. Ok, so I am not quite getting it. Do you premix and store the dry team in the pantry and then the day of baking, make the the wet team?? Actually, it says to mark a bag with the wet ingredients and instructions (essentially putting the rest of the recipe on the bag, so you have it when you make them)! Yes, you can double it. What would be the baking time in the mini muffin tins? Try 10 minutes and then test. Sorry I didn’t keep a record of that. My bad. I made some with my daughter today and we tried them when they were still a bit warm and we LOVE them! delish! Definitely going to make up some mixes to have on hand! Thanks! I feel a brownie craving coming on!! I made these tonight for Valentine’s Day and loved them! I was a little apprehensive thinking they might be too rich, but they were great! I am going to give this a try. I love the idea of saving money with the boxed mixes. Made these yesterday – so much better than boxed. Even my husband, who hates chocolate, loved them 🙂 Thanks so much for the recipe. What would you use to substitute for the instant coffee? I have none on hand and am trying to avoid buying extra new groceries because of the pantry challenge!! Thanks!! @Erica, those mix-ins are totally optional. You don’t have to add them at all. @Jessica, Sweet! I cannot wait to bake these up as mini muffins! I made these the other night and was disappointed… pouring in the wet team made for a huge mud-ball of sorts. I had to basically shape it to fit in the pan; it wasn’t wet enough to settle/pour on it’s own. I verified the recipe to see if I’d done something wrong and it didn’t appear that I missed anything or flip-flopped amounts of ingredients. Nope! Took them out at the appropriate time and ate them warm. They tasted delicious, albelit oily. By the time they cooled (and certainly the next day) they were very greasy, and grainy (which made me think “too much sugar”)! I’m going to try again and see what happens… maybe it was just a fluke. That does sound odd. I’ve made these hundreds of times. I typically add the dry to the wet and then fold very lightly. You don’t want to over mix. It should be thick, but not like you’re talking about. I hope it turns out better next time. Came out completely different the second time. Absolutely perfect. The only thing I can think of is the cocoa powder… I used special dark the first time. Not that that should’ve made a difference, but it’s the only “different” item I used. We’re headed to a friend’s house for dinner later in the week and I’m totally making a batch of these to take with us. Mmm! Love the simplicity of this recipe. I have everything in my pantry. I’m going to use carob powder instead of the cocoa. I use it all the time, tastes good. I plan on doubling the recipe for our family of 9 🙂 they like to eat, lol. Thank you for the recipe. Loving your series!!!!! Thanks for the great feedback. Sounds yummy! Well…I made them last night. They were going to be our treat during family game night. I mixed the ingredients together & placed them in the oven. I set the timer & proceeded to clean up. About 10 min later i realized I didn’t put any sugar in them!!!! Ugh!! I ran to the oven & sprinkled some candy corn on top, which melted all over the top. Out of the 9 of us only my 12 yr old son ate a whole brownie 🙂 he ate 3. Crazy kid! Sounds a little like the paleo brownie I made last night. It’s all memory-making, though. Yay! Free of partially hydrogenated oil!!!!! Gonna keep this in the pantry. Can’t wait to try this recipe! how many does it make? The recipe makes an 8-inch square. These are so good. I love how fast they are to make and I didn’t even have they dry team mixed ahead of time. If I made a mix ahead, I fear it would be much TOO easy for me to indulge more often and at this point, thinking how I just enjoyed the last 3, that could be a bad thing for my body. Anyway thanks for sharing the recipe, it’s definitely a favorite! So glad you enjoyed them! They are too good, sometimes, eh? Water makes the fudgier? I had no idea! Thanks for the tip. Do you omit anything? Like a previous commenter, I attempted this with Hershey’s Special Dark cocoa and ended up with insanely thick batter. I had followed everything to a T, so as for food science I have no idea why it happened. I added enough liquid (milk) to get the batter closer to the texture I thought it should have (a little thicker than a boxed mix, but still spreadable) and increased the bake time. The result was fudgy, incredibly moist, satisfyingly chocolatey brownies that my son declared the best he ever tasted! Well, I’m glad you arrived at the right spot, even if it took a little work to get it there! I had some weird results with other recipes when I used special dark. I wonder why…. Do you know how badly I want brownies right now??! I hope you made some! I really love the sound of this recipe, especially as you can make up a dry mix in advance! I’m so sorry, could you give the amounts in grams, I find it difficult to work out cup sizes etc! Yes, plain. Most gf blends are extra sweet, so you may want to reduce the amount of sugar just a tad. I recently discovered a simple technique of letting the cocoa “bloom” to enhance the chocolate flavor. Just warm the oil in the microwave slightly 20-40 seconds, then mix in the cocoa and let the mixture sit for 10 minutes. Treat the chocolate mixture like a wet ingredient and follow the regular direction. I really liked the results! These are good. I substituted a stick of butter (1/2 cup) for the oil since…well…butter. Also, chopped up a half of a dark chocolate bar languishing in the pantry and threw that in at the end. I’m at altitude and I baked them in a 9″ round cake pan at 350 for 30 minutes. Cut into wedges, it looks fancy-schmancy. Just took a leftover out of the fridge and nuked it for dessert. Yum. Sounds like your adaptations are fantastic. Kudos!